hi guys been playing relic for about a month now had about 8 games. sorry for the spelling, not my best attribute. consider these beta. been reading the posts for a while and i wanted to try some homebrews of my own. got some ideas i thought some people might like. first are two characters Custodie (doesn't leave terra so not fluffy) and Grey Knight (image is a terminator i know, only one i could find). both are the same as they for fill the same role i feel. but i wasn't sure if it was better to give them power cards or lives on leveling up. there special ability is hunting daemons (not scenario daemons, sorry) and not getting corrupted. i felt this was very fluffy for both characters. the stats are a mix between the space marine and psyker. im working a another character, adeptus arbites judge atm. EDIT: scale 869 x 694 px and grey now spelled correctly!!! i like this mission, i feel its very strong. it allows for PVP for people with out needing the Nemesis expansion. some one on posted a link to the Nemesis rule book a little while ago, so i ripped the challenge rules out and modified it for an interesting mission. it allows for two ways to win. the basis is that every one has been declared 'excommunicate traitor' or rouge and they have to fight there way out of the sector. the corruption rule sets a fun limit as traitors are hunted down. i wasn't sure how many tokens should be needed to enter the inner tier. ide like some feed back on that. the Tyranid mission has evolved in several ways. 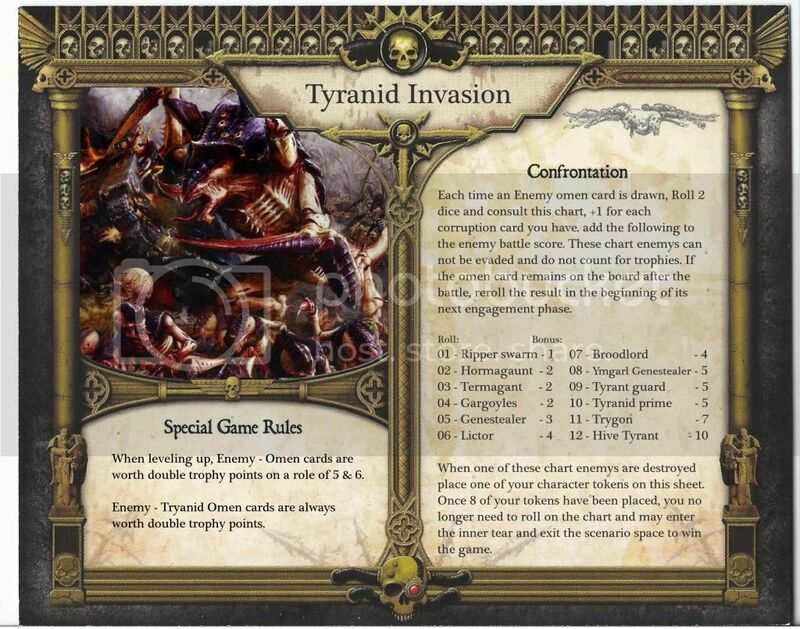 first i wanted it to be a war of attrition keep killing nids until warp charge 20 tokens are on the sheet. fight nids until 14 warp charge tokens are on the sheet and fight the hive mind at stats 14 and 3 lives then i wanted to do some thing like an invasion, every time you battle in the sector Tyranids invade until you have repelled the invasion and move out of the sector. not a strong one, good idea i thought just didn't know where to take it, any ideas? i would like to do some thing. i liked one of my previous ideas of adding stats each time a faction is drawn. so i came up with this Nurgle idea, a stronger and better polished one i think. the plague grows stronger with each Nurgle incursion. 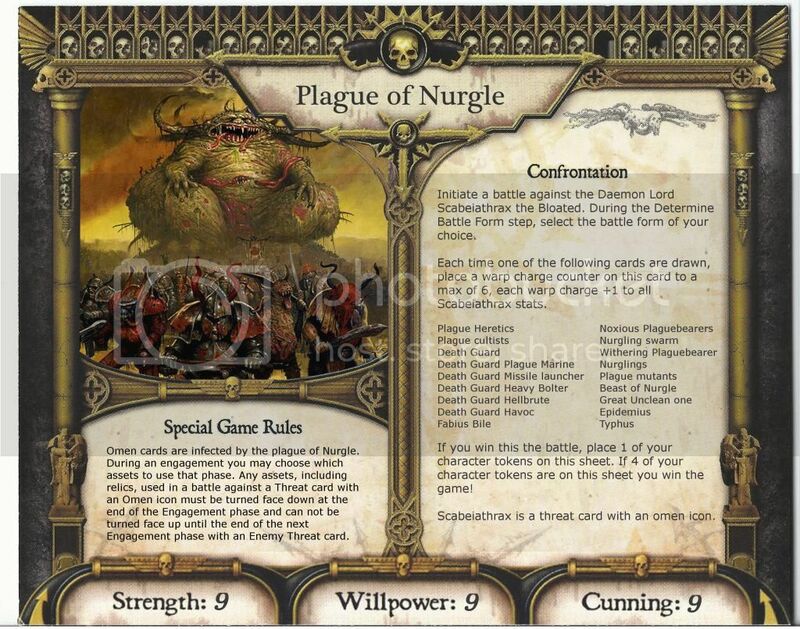 i love the plague of Nurgle idea, where weapons can be infected and decay. i think that will make some people very frustrated wile playing. i wanted to Incorporated the omen card abit more. a max of power 15 daemon prince could be fun. i wanted him to start on 0,0,0 and build up to 16 but i wasn't sure how quick this was going to be, he could be under powered by the time a player gets to him. do people like the 0 stat idea of as is? this last one was an idea for a 'just get to level 12 and win' idea with some gimmicks. im not sure i like it. any ideas on how to improve it im all ears or is it just a bust. 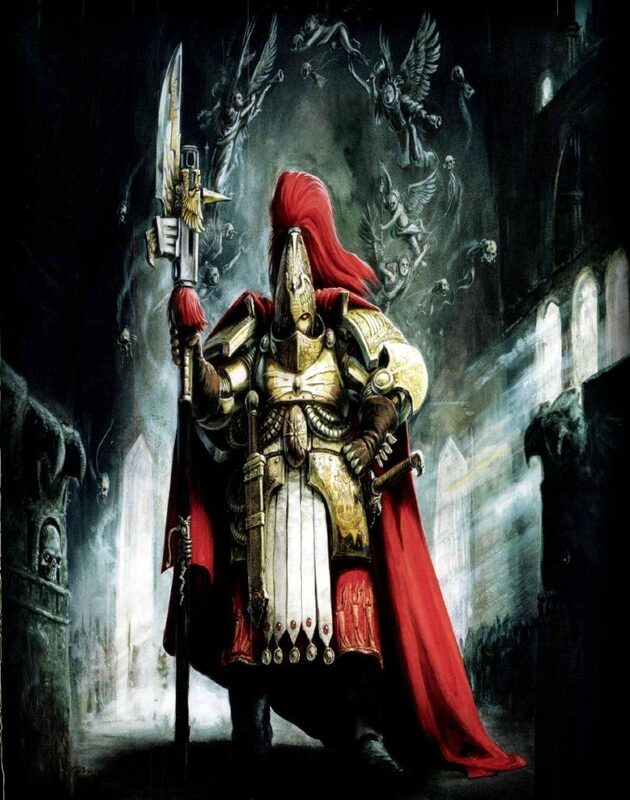 i have another idea 'Exterminatus'. collecting a total of 25 trophies from each threat deck before moving to the inner tier. omens are worth double, trophies can be used to level up but are lost towards the total. i may flush it out later and post it up, any ideas? Awesome. Always good to promote discussion on Relic through custom work. A hard part of design is creating clear english that consistently follows the english techniques of the game. Straight away I see you spelt Gray wrong in two places. You are missing a ' in enemy's. The battle bonus is a bit confusing at first glance. Remove the battle bonus graphic and copy the english from what an already present character has done, ie. the Inquisitor. Try get the character sheets in the same resolution as everyone else's. 869 x 694. Makes for easier printing to scale. These things are all easily fixed. This will dramatically increase the chances of your character being adopted by the public. With the second character, I immediately notice the image being too blurry. New characters generally aren't created unless they add a new mechanic or play style to the game and this character is 95% like the first character. The scenarios: my immediate thought is cool pictures, look interesting, but very wordy. I don't have time to read right now but I can already see spelling and grammar mistakes. eg Dule, enemys. Get a friend and/or an adult to proof read your work. If a custom piece of work doesn't look 99% professional then I have no chance of convincing friends to play it, they just immediately dismiss it. Interesting stuff, thanks scurge. I look forward to reading those scenarios in more detail later. Your dedication to perfection is commendable. Consistency for the win: 4 times you wrote Corruption card, but one time you decided to uppercase Card. During your corrections you accidently wrote "may" as "my". "Treat vanquished players as corrupted" sounds brutal. This can happen really easy during the start of the game. That makes for a very short gaming night for someone. Thus if there were 3 players, someone got corrupted round 4, then only a boring 2 players for the next 2 hours. "There are no devotees, everyone is an apostate"
"If you are vanquished then you draw a corruption card" - Not nearly as brutal as full corruption. "Place a character token on your sheet for each Skill Duel you win. You must have 6 tokens to enter the inner tier. You win when you reach the scenario sheet and escape this filthy sector." If people want to know the Skill Duel rules they can read the manual. This keeps your scenario sheet clean and easy to read. As per normal rules: You should allow people to continue playing after corruption as a new character if they desire. I've thought of creating a Grey Knight custom sheet as I like the model/lore. Your design is heavily based off the Inquistor and feels a little lacking in uniqueness and fun. 1) The Inquisitor is deemed one of the hardest heroes to win with (according to forum votes), hence why in my custom rules I buffed him to also gain +1 battle bonus vs Heretics and Traitors. Although you have a strong focus on Willpower gain which will help a lot compared to the Inquisitor. 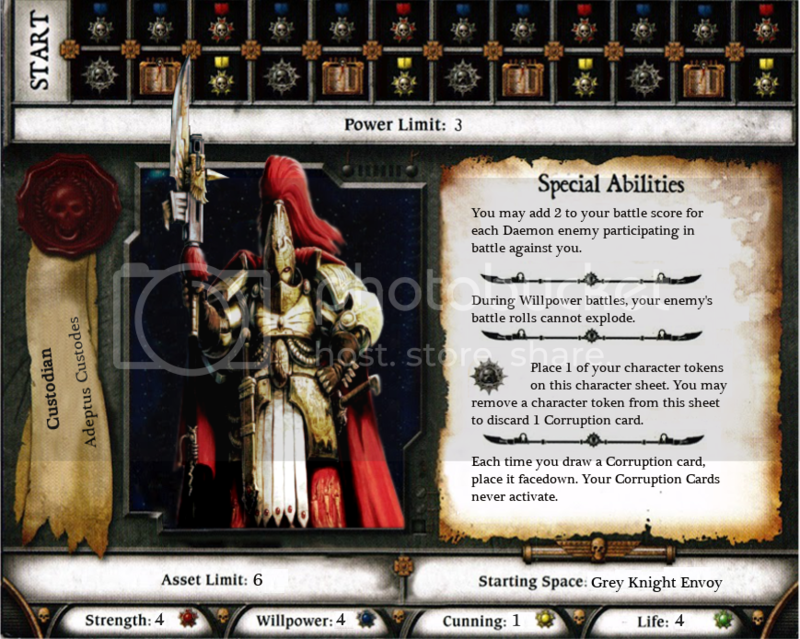 2) There are not many Daemon enemy cards for the battle bonus ability to come into play. 3) Doesn't have the Inquisitor's interesting movement mechanic. 4) Turning corruption cards face down is not fun. 5) Not being able to choose to receive corruption cards is not fun. 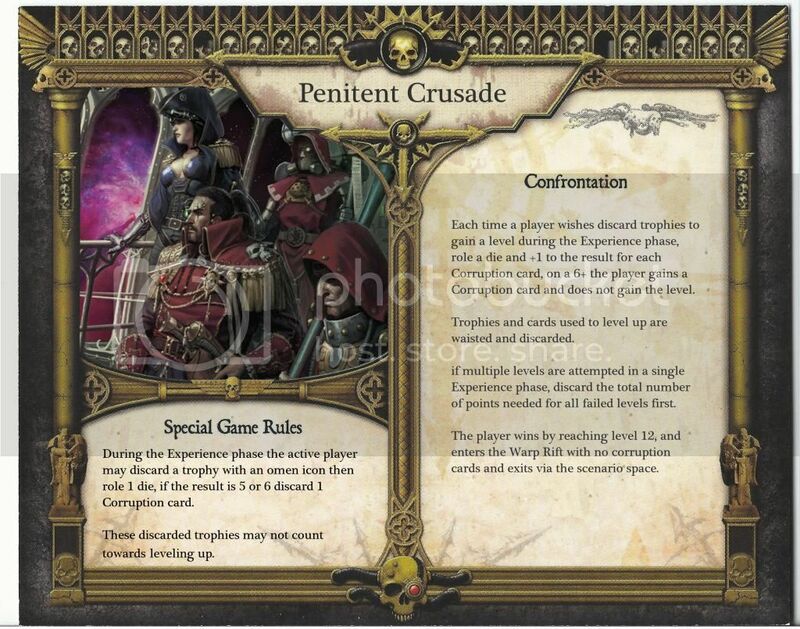 6) Not sure how often the skill bonus vs Daemons in battle rule will come into effect. Fundamentally I think this character design will play fine. Seems balanced. 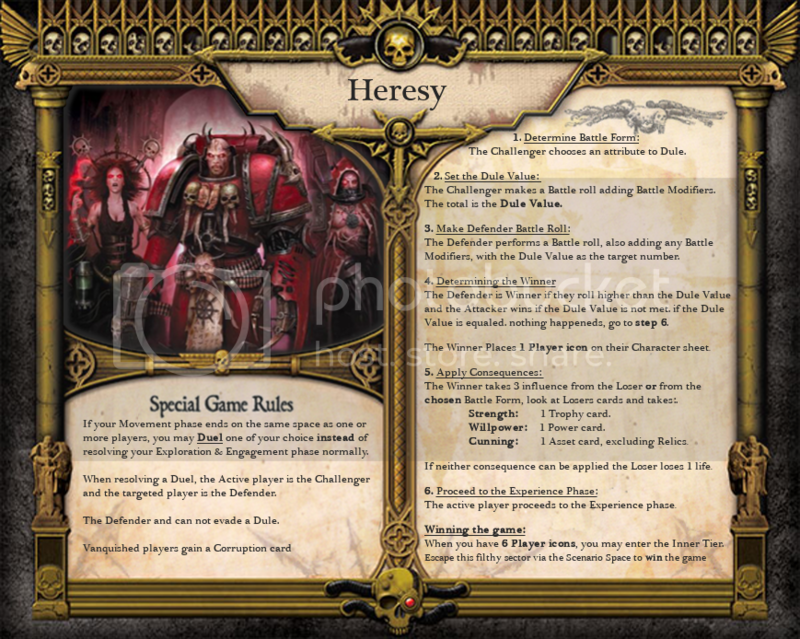 i have taken your good advice and cleaned my mission up abit, this is Heresy Mark 2. i like the corruption and movment in the inner tier rule, but im thinking this may be speeding the game up a bit too fast. i did want to change the Consequences again as these always seemed to me a little unbalanced, i think strength was allttle too strong. which was why i changed them in the first place. but ile leave it as is. i added a corruption card to the confrontation requirements just to make it a little harder, but probably. wount effect the game at all. ive reached the inner tier befor with out one. i would recommend picking up Nemisis to others as it is a good add on, i played it last night and it is a lot of fun. Here is the link again so you can use this mission. pages 4 and 5 for the PvP skill battles.